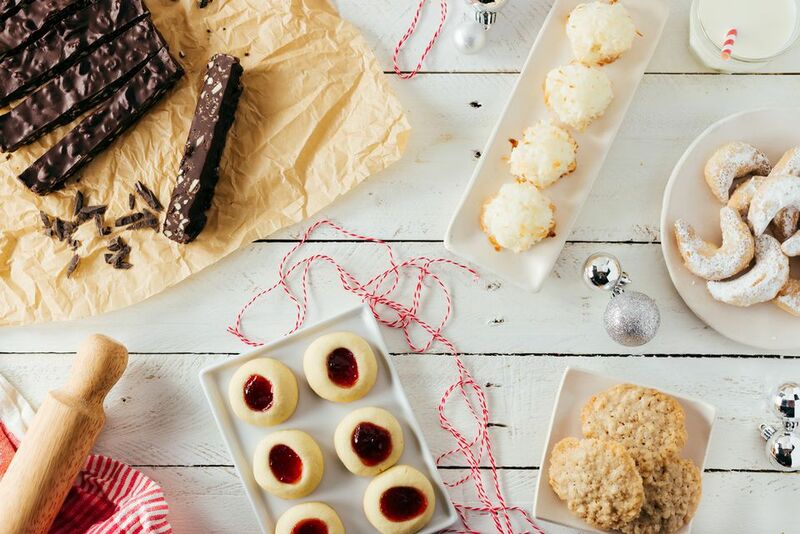 Tis the season for festive Christmas desserts! And the more there are, the merrier the holidays will be. Serve them to top off a delicious holiday meal, bring them to Christmas parties, or just enjoy the confections while decorating the tree. In these recipes, your favorite holiday flavors—such as gingerbread, caramel, and mint—come together in the form of cheerful Christmas cookies, homemade fudge that's perfect for gift giving, and one amazing edible cupcake wreath. Here's a fun handheld dessert that kids can enjoy at tree trimming parties and Christmas gatherings without making a mess. 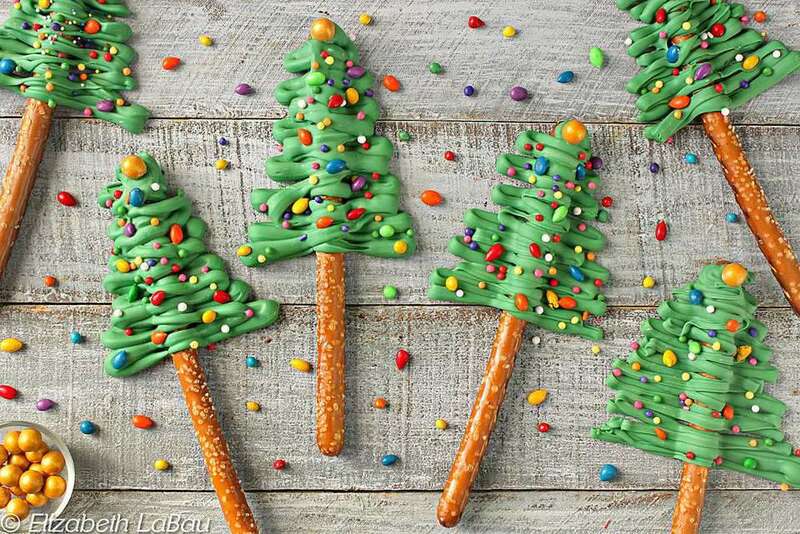 Little ones can even get in on the action and help decorate the Christmas tree pretzel rods themselves. Wow family and friends with a impressive chocolate candy cane cake. Three moist layers of chocolate cake are filled with candy cane-studded buttercream, then frosted with chocolate-mint icing. It's decorated with chocolate curls and mini-candy canes for a full winter wonderland effect. Add this candy cane-inspired fudge to your holiday baking list! Featuring white chocolate infused with bold peppermint flavor and swirls of festive red food coloring, the treat is best enjoyed while trimming the Christmas tree. Tip: make an extra batch for gifting to family and friends. You're sure to be the hit of the holiday cookie swap circuit when you bake up recipes from our collection, which showcases all the classics: gingerbread, shortbread, linzers, and even ugly Christmas sweater cookies! Here's a wonderfully festive pie for Christmas that vegan guests can enjoy without guilt. The lightly-spiced cranberry and pear filling is baked with maple syrup for extra sweetness, with a lovely and simple crumb topping to balance out the tart fruit. Feeling creative this holiday season? Craft a showstopping Christmas cupcake wreath. It's easy to make and you can eat every single bit of it, from the creamy frosting leaves to the sweet candy berries—even the super-cute chocolate-vanilla pinecones on top. It makes a great Christmas table centerpiece. Red velvet cake is as striking visually as it is delicious, making it just the right hue for a holiday dessert buffet. You'll mix vinegar and baking soda—just like a kids' science experiment—to make this cake rise nicely. Turtle candies are a favorite Christmas treat and make great holiday stocking stuffers for kids and adults alike. You only need three ingredients to recreate these popular pecan, caramel, and chocolate confection. Everyone loves the flavor and aroma of warm spiced gingerbread in the winter months. This great holiday recipe creates soft little truffles that taste just like gingerbread cookie dough. They're sure to disappear quickly! This fabulous maple pecan pie makes an indulgent dessert that's wonderful at holiday meals and buffets. Serve it with a big scoop of ice cream, or a dollop of whipped cream. When your palate gets tired of all that cinnamon and pumpkin spice, sneak a little summer into your holiday meal with a sweet-tart cherry pie filling in a crunchy pretzel crust. Your guests are sure to ask for seconds. This is a fabulous special occasion cheesecake. A divinely creamy filling is baked on top of a pecan graham cracker crust and smothered with a caramel pecan sauce that comes together in a flash. Citrus is at its peak in the winter months and this orange meringue pie is a refreshing change from the usual lemon. You can use a store-bought pre-baked pie crust for this recipe to make preparation easy, but don't skimp on the meringue topping to truly make a statement at your holiday table.